The discovery of the speed gene and the research surrounding it have pointed the eyes of the sporting world to where sport originates. No, it was not the legendary Arabian that gave speed to the Thoroughbred, instead it was the humble 'native English mares' of the early Thoroughbred studs. The research of Dr. Hill and Dr. Bower, along with their teams, and published in several papers, sometimes working alone or in concert with each other, they have produced over the last decade wonderful revelations for the breeders of all sport horses. I strongly recommend you search out their papers and read for yourselves. Others after them have added to the information as well. That I question a few of the published statements further on made in conjunction with this discovery does in no way detract from the importance of this work. And we need to keep in mind that all genetic, pedigree and historical work on our horses is very much a 'work in progress'. "This gene is also identified in the scientific writings as the Myostatin Gene or MTSN or the 'sprint gene' or ECA18--which is where it is found in the equine genome. The variant that carries the speed-sprint factor is identified as 'c' allele in the science literature, and the wild type or stamina version is called the 't' allele. The wild horse does not carry the 'speed gene' variant at all; its form is then homozygous for t/t. Not surprisingly the Quarter Horse and its near relative the Paint Horse carry the greatest concentrations of this gene, 90% of the individuals of these breeds they tested were homozygous for the variant--therefore they were c/c. This variant also is associated with bulky muscle form--once again these two breeds are dominant for this type also (Petersen et al 2013). 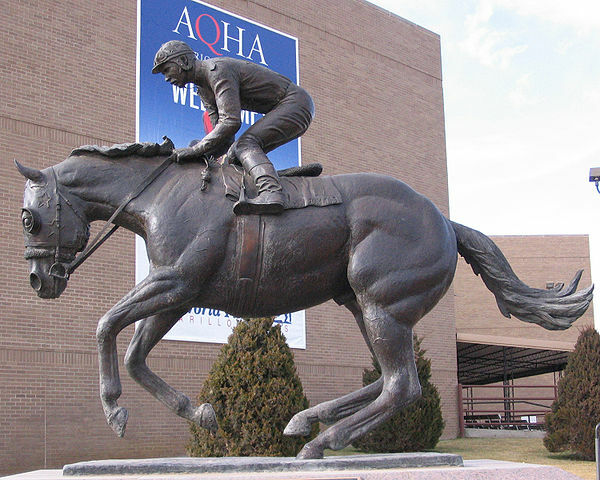 The Quarter Horse is the greatest sprint race horse breed in the world. "Found also in high numbers in the Thoroughbred, the speed gene is already being looked at as a tool to determine the best race distance for a Thoroughbred. The thinking being that those homozygous (c/c) will make good sprinters, those heterozygous (c/t) can excel at classic distance racing (one to two-miles) and those homozygous for the wild variation (t/t) will do best in stamina contests. They already have determined the Arabian, the great endurance breed, is t/t--it does not carry the speed gene at all." As you can see above in the image of Dash for Cash QH, his body has the bulky sprint muscling. What he does not have is a closely bred pedigree, a pattern identified as common in many sprint bloodlines in Thoroughbreds. And seeing that the qualities published on the speed gene seem pretty conclusive, any reasonable person would assume the presence of this gene causes sprint racing speed. When I follow the speed trail back through pedigrees and historical records it tells a similar story: that the 'native English mares', which we know as the English Running Horse and its parent breed, the Irish Hobby, is indeed the source of speed. In this country we can follow the speed trail as well, and it goes back to the early racehorse studs of Virginia, which began by 1624, when it was already documented that racehorses were being bred and tested there. Then we can go back to the first shipment of fast stock in 1611, coming off a ship from Ireland with horses for the sitting governor Dale and his associates; followed regularly over the years with ships carrying more Irish horses arriving until 1666. Those horses, plentiful and the pride of Ireland, were bred in the Hobby racing studs and shipped widely. Many went to England were they became the base stock of the racing studs of England as well, until they were almost totally destroyed by Cromwell (English Civil War). There are traces of those horses in Ireland racing for at least 1500 years before the purging--documented as racing in chariots at the dawn of the Christian era. The fast Celtic Horses originally arrived in Ireland on Phoenician trading ships, arriving from the northern Iberian Peninsula, along with the Celts themselves. From there back to the horse breeding industry in Northern Spain (Iberia) set up by the Iberian colony settlers. This same population of horse was sought out by Greece and Rome for riding and racing (Pliny). There is even some record that the Phoencians brought the horses to the coast of Spain when they set up their original colonies and that they came from the Anatolia region (modern day Turkey). Here is an interesting thing: the description of these horses remains the same all through the ages--a small, compact, gaited horse, with a docile temperament, possessing great speed and stamina. (See North American Sport Horse Breeder and Standardbred Sport Horses for more detail on this history). 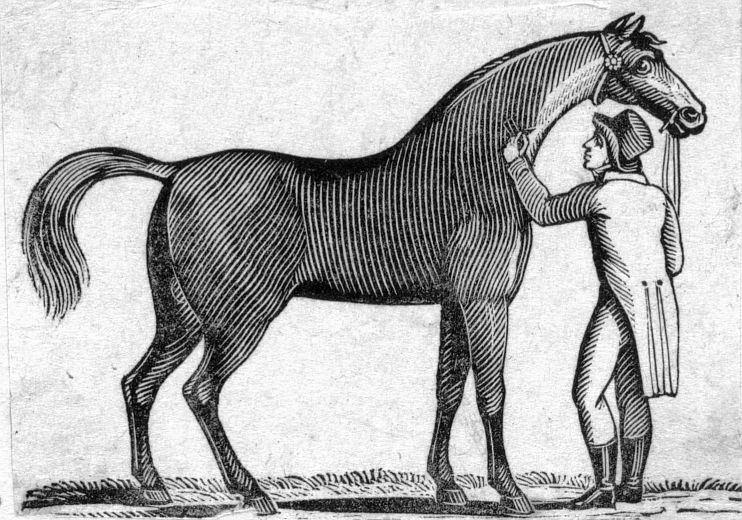 American Running Horse, with compact and heavy muscled form--wood engraving by Anderson--New York Public Library digital collection. Gaited? Yes, they always had the ability to gait, and it was those smooth mid-gaits that made them highly valued for riding horses throughout their history. Be aware the overall science community classifies the ability to gait as a mutation (not found in primitive horse genotype), but history does not agree with their conclusions (see Gait-Keeper Gene). Except for the gaitedness, it seems really consistent with our Quarter Horse. Although many Quarter Horses did amble naturally, even quite recently. Things are not always as cut and dried as they first appear. When the scientist Clive Harper evaluated pedigree patterns in the Thoroughbred (Thoroughbred Breeders Handbook) with scientific methods, to see if he could determine a consistent pattern in the winners, he came away with statistics on which pedigree patterns produce more winners. He also found some surprising patterns that indicated sprint speed versus stamina. Concerning sprint speed he found that inbreeding, especially to close relatives often produces speed. And here is a key finding: it didn't seem to matter if the inbreeding involved sprinters--often it was stamina horses.And he found the stamina horses had a common pattern as well: the majority had a strong buildup of a ancestor and/or its close relatives in the background of the pedigree. Now, as we saw above in the great Quarter Horse Dash for Cash, he did not have a closely bred pedigree--in fact, aside for a double of the mare Selene, his heaviest dominant ancestors is Ben Brush and Domino in his background (7-10 generations) and he has much tighter breeding in his background--like a stayer. So here we are again with a finding, this one statistically proven, but it too is not a rule, just a probability. But don't think Harper's work doesn't have merit, indeed some of the greatest sources of speed have close inbreeding to a stayer--examples below. So how can Dash for Cash QH, one of the greatest sprinters ever, be so loosely bred close up and still have the rapid fire muscling and tremendous speed at sprint distances? We might guess it is because the Quarter Horse breed and its direct ancestors, being selectively bred for sprint speed for centuries have made the trait totally dominant in their gene pool, so that all their common bloodlines--including the Thoroughbred ones (like Three Bars) are completely homozygous for the trait. Whatever the cause, it sure looks, just like in the DNA studies, that there must be variables, where there are still missing pieces to the genetic puzzle. For a standout example of Clive's theory in action we only have to turn to the horses that are inbred to the 'king of stayers': Lexington RH--a horse, who by any measure published by science, should be t/t--that is if any horse shouldn't carry this gene, then it should be him. And his offspring and those of his fantastic staying sire Boston RH, were the top distance Running Horses until well after the Civil War. By pedigree, Lexington RH has both tremendous close breeding: Diomed 4x4x5, Wildair Mare 4x4, and tremendous background buildup of another mare, Cypron--he has twenty-one lines of her in the 6th through 10th generations. Lexington RH is the greatest sire ever--still holds the world wide stallion record of sixteen years, plus he could race and win not just in those grueling heat races (set world records), but it was said he was invincible at any distance from a half mile on--and that any horse that could sort of stay with him for a mile was completely left in the dust by two miles. He ruled in speed at all distances except sprint, and he could sustain it. He and his sire Boston RH completely dominated the sport with their progeny for forty years. Lexington RH, son of Boston RH, as the supreme racer in the late 1850s and early 1860s, then it was his nephew Planet RH, then it was a Lexington RH daughter Idlewild RH, and after the Civil War it was his son Harry Bassett RH--this was in heat-racing, not dash. His grandson Fellowcraft was the only horse that beat his world record, and then by 1/4 of a second--never to be broken any time by any other horse. Born as the 20th century was dawning, two important sires: Commando and Hamburg, can teach us more about speed transmission. Commando--the greatest son of Domino, he carries five lines of Lexington RH. Does he appear to have the bulky muscle type of a sprinter? Commando is fascinating. His sire Domino was a champion sprinter and he sired speed--usually sprint and classic racers, and as we saw he received his dominance in speed from a saturation of the greatest stayer there ever was. But Commando was not a sprinter--he won the Belmolnt Stakes, and as Thoroughbred pedigree expert Les Brinsfield has pointed out, if he won the Belmont today we would be calling him a stayer. And Commando sired classic and stamina horses, including the world beaters Colin, Celt and Peter Pan, and Colin even beat the leading stamina horse Fair Play (sire of Man O' War) and grandsire of Discovery--top stamina lines even today. So did Commando pass on speed? Yes, tremendous amounts of speed consistently, which leads me to guess he and his sire had to be at least t/c or even c/c for the speed gene---not the t/t his performance would suggest. A look at his pedigree reveals his massive genetic consistency of five lines of Lexington RH, plus one of his 3/4 brother Lecomte RH (4x5x5x5x5x5), plus four of the Lexington RH offspring are 3/4 siblings, out of Glencoe mares (4x4x4x4) which is the equivalent of them sitting in the 2nd generation. This is the pedigree of a powerful typesetter, and that is what he proved to be. He passed on speed--no matter the distance. Here is another, even more challenging to the conclusions made by our science of today: Hamburg 1895. Hamburg--he sure looks like a Quarter Horse to me! Was he a sprinter? 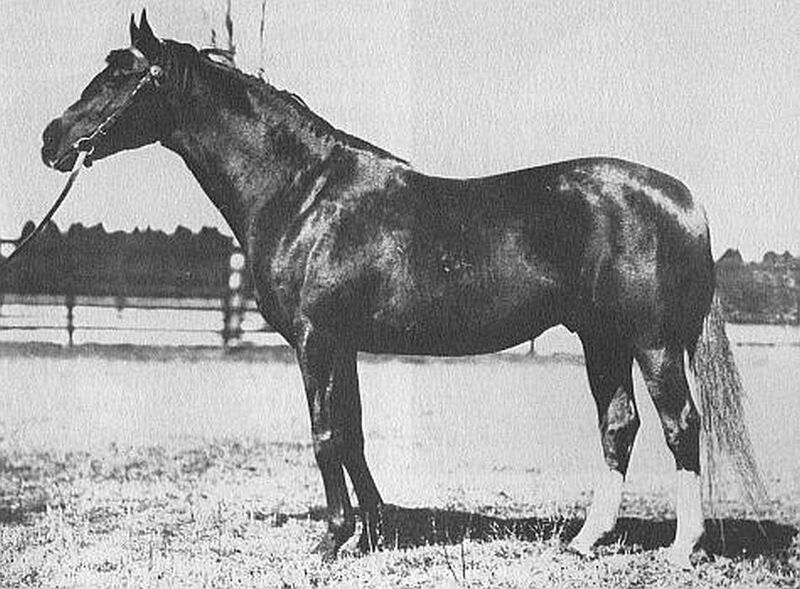 Close in similarity to the dominance found in Commando's lineage, but in Hamburg's pedigree the Glencoe element is almost equal to the genetic weight of Lexington RH, because he contains two lines of Vandal RH, a son of Glencoe which bolsters the Lexington RH daughters and son that have Glencoe as a dam-sire. "Hamburg is about as good as it ever gets--a colossus among champions. He was a great weight carrier, and he was so full of energy and fire and so fast out of the starting gate the officials were often questioned about his time. He had a savage appetite, and they tried a muzzle and all sorts of tricks to slow him down from wolfing his food. He needed to be worked regularly, and he ran his best when he was kept in hard training--given too much time off and he would become difficult. "Hamburg was flashy; a bay with a blaze and two hind stockings, and his hind end was large and muscular like a Quarter Horse. He was a handful--not many could ride him, he would just buck them off, and while he was a true stayer he also possessed speed. He won the 2 1/4 mile Brighton Cup by one hundred lengths, and he beat Kentucky Derby winner Plaudit in the Lawrence Realization and won multiple stakes races easily. 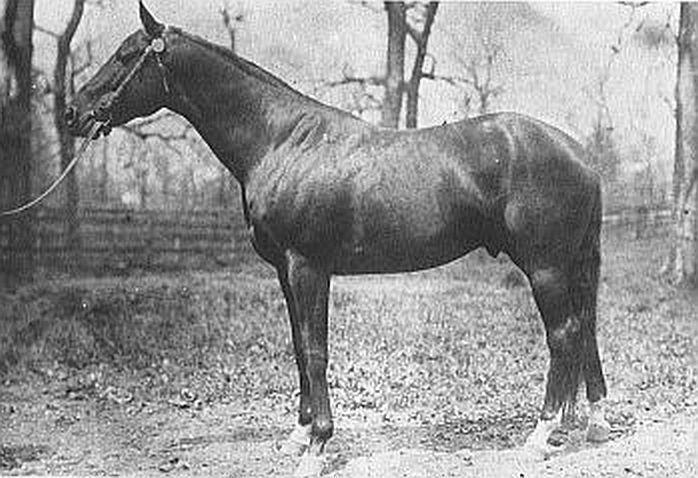 He was a great sire producing twenty-seven stakes winners and Hamburg was the leading sire of 1905"
So in Hamburg we have an extraordinary physical specimen, brimming over with energy, explosive speed and power, hard to contain and manage--a phenomenon really. He looks just like a Quarter Horse, runs like one, sprinting out of the gate with top speed and so fast his time was regularly questioned. But he was a stayer--beating Plaudit (Kentucky Derby winner) in the Lawrence Realization--a race of 1 5/8 miles, and he won the Brighton Cup--a race of 2 1/4 miles by one-hundred lengths--winning by such a huge margin was a feat only equaled by Man O' War several years later (Lawrence Realization). As a sire he consistently passed on speed as well as staying ability, just like Lexington RH did. And he possessed not just tremendous speed but an extraordinary metabolism--his energy conversion rate was astounding (mtDNA). Perhaps you would agree with me when I say that the quantifying of the speed gene as just a sprint gene, and that its presence can be used as prediction of racing distance ability, needs some adjustment. Hamburg certainly possessed speed so blistering the judges' times were checked over and over--he ran like a sprinter, but he did it for staying distances. Or maybe it is like the Horse Genome Project said in their report, that there is more than one speed gene, and some of these amazing stayers carry some other speed gene. There is no denying that there were and are stayers with speed--I think Secretariat qualifies under that category as well. Hamburg by the way is genetic gold, especially on the dam-line. 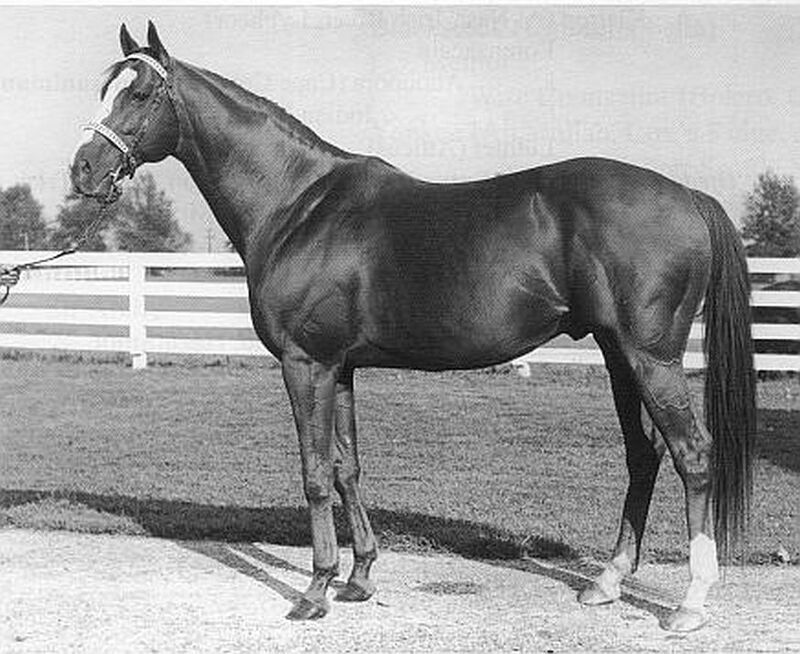 He was inbred 3x4 to the 3/4 siblings Aerolite RH/ War Dance RH, which made him a dynamic nick with the Fair Play family (Aerolite is dam of Spendthrift, the dam of Hastings, the sire of Fair Play) and with the Domino dynasty (War Dance RH is his second dam-sire). His daughters have powered champions for over a century, here are a few: the chef de race Bold Ruler (sprinter), Discovery (stayer), and Tourbillon (classic and stayer), are just a few that come to mind. His daughter Frizette, of the many 'reine-de-course' Hamburg daughters, created a racing dynasty in both France and America. It gets no better than this. And for sport horse breeders, Hamburg, Domino, Commando and Fair Play, along with the common critical mass ancestry of Lexington RH and Vandal RH, are root jumper lines as well (see Legacy of Lexington and Standardbred Sport Horses for more on jump lines). Djeddah, a Hanover warehouse (sire of Hamburg) and a chef-de-race for sprint. Here is the French-bred Djeddah, who carries inbreeding to the full sisters Heldfann and Durban 3x2, whose second dam is the Hamburg daughter Frizette. He is also empowered with tremendous line-breeding to Omnium 5x6, Bay Ronald 5x6x5, Hanover 7x7x6x6 and Teddy 4x3 (stayers)--an extraordinary sire, he too is a chef de race for sprint. What I can surmise from all this is that speed transfers with or without the sprint characteristic, and so I think the classification of c/c for sprinters, c/t for classic racers and t/t for stamina racers is incomplete. We will see a similar scientific shortcoming with the Gait-Keeper Gene testing promotion. The historical record just does not back up the scientific conclusions. Does this mean science is wrong? Not necessarily, just that it is not as neat and clean as they present so far. It looks like in isolating each gene they find, then pouncing on what they believe it represents, and then rushing to promote their gene testing service, that some hasty pronouncements are used as selling points; this may turn out in the end to be a disservice to the breeder. See stamina gene for a possible explanation to this dilemma. The discovery of the sprint gene is science at its best; the quick classification of its power to effect racing distance is flawed. It is obvious that the bulky muscle gene study can also appear in bonafide stayers--as we saw in the stayer Hamburg who looks just like a 'bull dog' type Quarter Horse. Our original Running Horse, first was tested in sprint racing, but it also excelled in stamina, and it too, as you saw at article start, was of that same compact muscular build--leading me to think once again that some other unidentified factors exist then what they covered in these studies--- a wonderful work in progress.